Retinoblastoma is a tumor of the retina that generally affects children under 5 years of age. If not diagnosed early, retinoblastoma may result in loss of one or both eyes and can be fatal. Unlike most cancers that are diagnosed using a biopsy, retinoblastoma tumors cannot be directly biopsied. Although it is one of the first cancers to have its genetic origin identified, ocular oncologists have not been able to use this information to optimize treatment since they can only access the tumor if the affected eye is removed (called enucleation) in the course of treatment. A recent study by a team of investigators at the Vision Center of Children’s Hospital Los Angeles and the University of Southern California (USC) Roski Eye Institute, part of Keck Medicine of USC, provides proof of concept for a safe and effective way to derive genetic information from the tumor without removing the eye. Results of the study will be published in JAMA Ophthalmology on October 12, 2017. 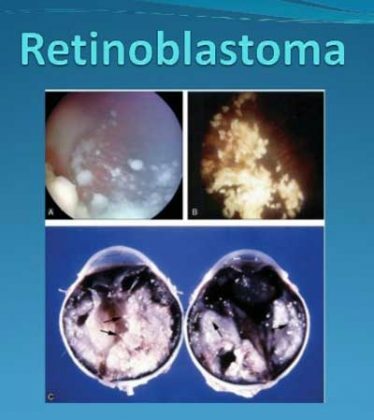 Retinoblastoma was one of the first tumors to have its genetic origin identified; the RB1 retinoblastoma tumor suppressor gene mutation was discovered by A. Linn Murphree, MD, a co-author on this paper, who established the Retinoblastoma Program at Children’s Hospital Los Angeles. However, ocular oncologists have been limited in their ability to use this genetic information to inform diagnosis and the application of personalized treatments since removing tissue from the tumor in the back of the eye could spread tumor cells outside of the eye or even to the rest of the body, resulting in a far worse prognosis for the patient. Retinoblastoma is treated using chemotherapy given either intravenously or through the ophthalmic artery. There are limits, however, to the amount of drug that actually reaches the eye. As a result, relapse does occur due to small tumor particles that break off – or seed – from the main tumor. The treatment for these seeds changed dramatically in 2012 when intraocular injections of chemotherapy were shown to be safe and effective. In order to inject chemotherapy directly into the eye, it is first necessary to remove a small amount of fluid, called aqueous humor, from the front of the eye, to decrease the pressure within the eye prior to injection of the medication. The study reported on six samples from three eyes affected with retinoblastoma, in children less than 3 years of age. Two of the eyes had been removed primarily for treatment of the disease; the third eye was receiving intraocular injections as therapy but ultimately had to be removed due to disease recurrence. Aqueous humor was taken from all three eyes and allowed investigators to compare tumor DNA in the aqueous humor to DNA found in the retinoblastoma tumor.